A four wheel tracked fiberglass cart with a flat bed that is 12' long, 6' wide, and 1" thick. The bed of the Mars Cart is 3' above the ground. Tracks are better for towing over soft material. The wheel tracks are 6" wide, 2.9' tall. The wheels are made of 1/4" thick aluminum alloy. There are no long axles for the wheels, each wheel mounts directly to the side of the Mars Cart. The top of the bed of the Mars Cart is covered with solar cells that are beneath a 1/4" thick plastic panel that protects the solar cells from being damaged when the cart is being used to haul supplies. When pulling the cart empty the solar panel wire can be plugged in to the Long Range Rover external charging point or the ATV's to help power them. The carts 72 sq ft of solar panel should produce about 500 watts an hour on Mars. The wheel tracks on the Mars Cart turn freely, they can't be locked or steered. There is no brake and the wheels don't turn sideways. 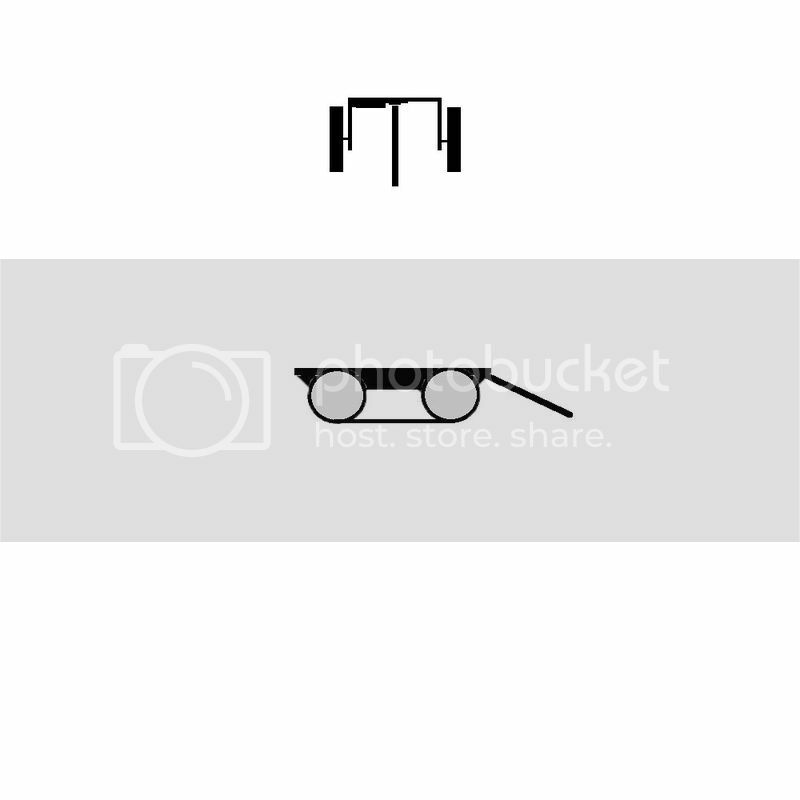 The tow bar pivots to the left or right as the pulling vehicle turns, the cart follows. The Mars Cart tow bar is 4' long and made from thin, 1/8", tube steel and it has a typical steel female hitch fitting on the front and another female hitch fitting on the back that fit onto hitch ball's mounted to the front of the Mars Cart and the hitch ball on the rear of the Long Range Rover and ATV's. Where the front hitch connects there is a thin steel plate, 1/8" thick, 1' wide and 12' long, that runs the full length of the Mars Cart bed. This plate is attached with many small bolts that go completely through the fiberglass bed so the hitch can't rip off the front of the fiberglass cart. The Mars Cart should be able to move all Mars Habitat building components: solar panels, food, pre-assembled wall sections, floor sections, and ceiling sections. Water and plants could be moved during the daytime but they would have to be moved inside the Long Range Rover at night so they don't freeze on the exposed Mars Cart. I don't know if the cart would be able to carry the biggest RTG reactors. They weigh about 1,000 lbs on the Earth, on Mars they would weigh half that. The cart should be able to carry all the other RTG's though. The cart also has a compartment built in to the underside of the bed that stows a cargo net and cargo straps. Everything on the surface of Mars weighs roughly 38% of what it does on Earth. If an object weighs 1000lbs on Earth, it weighs 380lbs on Mars. Okay, so a big 1,000 lb RTG will weigh 380 lbs on Mars. I think this Mars Cart can handle that. Zubrin planned for a 1kw reactor that weighed 7,000 lbs on launch. So it would weigh 2,660 on Mars. I don't know if this Mars Cart can carry it over uneven terrain and rocks without damaging the Mars Cart. The sides are going to flex. If that's the weight it has to move then I think it will need some reinforcement, maybe a thin steel plate on the underside. It's hard to know without making a Mars Cart and testing it. Also, I have to come up with some way to lift the 2,660 lb reactor onto the Mars Cart and then setting it at the base. Now, if the Earth Return Vehicle is launched from the top of a mobile MOXIE that has this big RTG built in, then we don't need to use the Mars Cart and we can just drive over with the rover and tow the used ERV platform, the MOXIE unit, to the base. The tracks will help with the up and down vibration, compared to just wheels. This Mars Cart has cargo straps and a cargo net. The straps would be the thin 1" wide ones, I don't know what they are rated at but to break one would take more than just vibration and bouncing. It would have to wear against some sharp edge. I get why you don't want to have an axle but the wheel will need some kind of bracing to handle the torque generated by the weight of the car acting on the wheel. It's made of 1" thick fiberglass so it's got some stiffness and strength. I do think that with very heavy loads the sides would bow out some so I think it may need a thin, 1/8", steel plate on the underside. Many vehicles don't have axles. My car doesn't have an axle on the front or the rear and it weighs over 3,000 lbs. If you overload this Mars Cart, well, then it's going to break but most of the things it's going to move are lightweight anyway and with Mars less gravity I don't think it's going to be a problem. Zubrin's plan called for a 100kWe fission reactor, not a 1kWe reactor. The weight estimate for the reactor Zubrin wanted to use was 4.5t (9,900lbs). Included in that estimate was the weight of the rover and power cabling to connect the reactor to the ERV to produce LOX and LCH4 using gelled liquid hydrogen imported from Earth. The reactor was carried in and deployed from the ERV. The rover would place the reactor in the crater and connect the power cable from the reactor to the ERV. Zubrin's fission reactor mass estimate was based on older small fission reactor technology developed by NASA. SAFE-400 didn't exist at the time he made his first presentations. You could combine the functionality of the ATV, dozer, and cargo carrier into a single tracked vehicle. An ATV class vehicle needs enough weight and power to bury the habitats in a reasonable amount of time. Your ATV with the dozer blade works well for moving snow because it's heavy, has a lot of power for its weight, and the snow is comparatively easier to grade relative to compacted dirt. I would think this application is a prime candidate for fuel cell and super capacitor technology. The super capacitor would power the electric drive motors for an hour or so and then the fuel cell would activate to recharge the capacitor. Rinse and repeat. Yeah, the damn ERV would have a large MOXIE built in and they require a lot of power. I think it's because they use pure electric heaters to heat the CO2 up to 800 degrees. Anyway, the ERV with the large MOXIE and reactor is going to be big. I think the ERV should be a smaller vehicle that takes the crew into orbit where it docks with another transfer vehicle, think that's Mars Semi-Direct. And I think the large MOXIE that is left behind should have tracks so settlers can tow it to a Mars Base. A 9,000 lb reactor would weigh 3,400 lbs on Mars. I don't think my Mars Cart will do it, not without a steel plate underneath it and even then I think it's too heavy for it. NASA would have to build a Mars Cart and take it out and test it over rocks and sand to know for sure. I guess the Mars Cart could just be built stronger, with 2" fiberglass instead of 1", and still have a thin steel backing plate underneath. Any Mars rover is going to have a difficult time moving something 3,400 lbs and besides, how do you pick up a 3,400 lb reactor on Mars? I could combine my ATV dozer and cargo carrier into a single vehicle? Yeah, my Long Range Rover design would have mounts for a forward blade, maybe one with a triangle shape for plowing soft sand and rocks out of the way, and maybe a curved blade that would scrape the surface for digging. I just felt that the Long Range Rover was too important to use for that purpose and the ATV's give you full field of view whereas the LRR you can only see forward. The vehicle could have a fuel cell? My original rover idea I posted many years ago, the Mars Manned Vehicle, actually had 2 fuel cells and carried oxygen and hydrogen cylinders on the outside of it and then had a large flat solar panel array on top. The problem is that it was over 4,000 lbs launch weight, double what Zubrin allotted for it. My new LRR is only 16 lbs over the weight limit. Scaling up MOXIE to produce propellants for the ERV would require a substantial amount of power, ~12kWe according to MIT and NASA, to produce 2kg of oxygen per hour. You'd still have to import hydrogen from Earth to make methane. Water electrolysis is substantially less energy intensive and does not involve high temperature components operating for many months at a time in a dusty environment. The process produces oxygen and hydrogen gas. The hydrogen produced from water electrolysis can be reacted with carbon dioxide from the atmosphere in a Sabatier reactor to produce methane. No hydrogen feedstock transport or storage is required since you're getting that from the water you bake out of the regolith. ISS currently produces oxygen from water electrolysis and dumps the hydrogen overboard. On Mars, we'd pump the hydrogen into the Sabatier reactor. Baking dirt and storing water is easier than storing and transporting hydrogen tanks and requires temperatures far below those MOXIE requires to break carbon-oxygen bonds. If we break off chunks of ice from buried glaciers, there's no simpler or easier way to get what we require to make propellants, breathing gases, and potable water. At an industrial scale, harvesting water from glaciers is a more practical approach than compressing and heating CO2 to 850C (1,562F). A fuel cell and battery or supercapacitor setup should be practical for grading tasks around the base (leveling construction sites and burying habitat modules). The capacitor would survive a greater number of charge/discharge cycles than a battery and has substantially higher power density, but energy density is low. That would help provide short bursts of high torque from the electric motors to move regolith. The reactor weight I cited was associated with SP-100. NASA has SAFE-400 now. Simply put, it's substantially more efficient at converting thermal power to electrical power and the reactor weighs substantially less. SAFE-400 would weigh about 380kg on Mars. With respect to lifting heavy objects, we typically use leverage. Carrying 500kg or so should be within the realm of feasibility for the Mars cart. Carrying 4,500kg is probably out of the question. Initial ice extraction might be carried out by warming a patch of ground under a large transparent plastic tent. Water vapour would condense into frost on the inside and this could be scraped off and collected. Drills, Explosives, bucket loaders, crushers, screens and feed hoppers as well as heating equipment to separate water from rocks, sand etc. This means we will have to transport industrial equipment items, because it will a long time before this kind of thing can be made on locally. With luck we will find massive ice so that separation and purification requirements are minimised. With a but more luck, we will find the massive ice exposed in a position where we can use open cast techniques to extract it. Current ISS Sabatier reactor is that there is one on board to get the oxygen back from the Co2 that the scrubbers remove from the air. SABATIER SYSTEM FOR ISS with a sole source contract to Hamilton Sundstrand. Bobcat skid steer loaders are 6.5' tall, 5.3' wide with buckets that are 5.6' wide, and they weigh 6,500 lbs which is fine for moving Earth dirt but overkill for Mars. Also, Martian bobcats won't need a fuel tank or an engine and radiator. They would be replaced by deep cycle batteries and electric motors mounted on solid axles for movement and it would need an electric motor to power the hydraulic pump. A steel 1,600 lb Earth weight bobcat would weigh 608 lbs on Mars, add in the operator weight and it would weigh 684 lbs. It could be a foot thinner and a foot shorter than an Earth bobcat and it might have a 3.5 foot wide bucket. The 3.5 foot wide bucket, when full, would move about 322 lbs of Mars regolith. Zubrin's Mars Direct plan included two open rovers weighing .8 tonnes, that's 1,600 lbs, so they would be replaced by this battery powered Marscat. On the Earth the dirt has been laid down for millions of years as dust mixed with air. The air molecules act as tiny balloons, preventing compaction, but as water sinks into the ground it forces out most of the air. So, over time water helps naturally compact soil. On the Earth we speed up the process of compaction by using water and heavy equipment to get the air out so that the dirt will be able to support very heavy structures. The process of natural soil compaction probably happened on Mars long ago when it had oceans and rain but it hasn't happened in a long time. Now Mars probably has a relatively low compaction (low compared to Earth dirt) surface of mostly dust mixed with CO2 so it should be relatively easy to dig through until you hit permafrost. Once you hit permafrost you just let the sun warm it up in the day time and melt the ice which will turn to water vapor, then start digging again. My last post was very off-the-cuff since I was busy with other things. My math was wrong as a result. The total mass isn't that far off, though. In retrospect, the new K2 cells, not the BCAP3400 cells are what we'd want for this application. Maxwell's K2 cell model number is "BCAP3000 P300 K04". The K2 cell's nominal voltage is 3.0v, capacitance is 3000F, maximum stored energy is 7.2Wh/kg, nominal mass is still 520g (same as BCAP3400), and nominal cell dimensions are still 60.7mmD x 138mmL (same as BCAP3400). To generate 120vdc, a minimum of 40 K2 cells per module must be connected in series. We'd probably use 48 cells per module, 8 modules per bank, and 2 banks per vehicle installation. Each installation contains 399.36kg of K2 cells and stores 2,875.392kWh of electrical power. To deliver 15kW of output to a 120V or 240V electric motor, the amperage draw would be 125A [EDIT: draw is 125A for all modules in one bank or 15.625A per module, at 120V or 240V]. The reason EV motors use high voltages is to diminish resistive losses (electricity converted to waste heat) during power transmission and to reduce the diameter and thus mass of the copper conductors. The electric motors found in Chevrolet and Tesla electric vehicles are all in the 300V+ range and higher voltages are quite common in EV racing motors. Google "YASA Motors" for examples of high voltage EV motors. Although YASA's motors are intended to run at high RPM, motors can also be designed to make nearly all of their torque at much lower RPM ranges. DARPA has funded development of motors for electric aircraft that are excellent examples of motors designed for lower RPM ranges. I used 120V as the voltage in my examples because most people are familiar with the 120V that comes from their wall outlets. This is unrealistic for a power train with minimal cooling requirements. I should also define what I mean by a module. The bus that carries the current to the electric motors is separate from the physical super capacitor modules. To ensure that each super capacitor module in a bank is easily handled without mechanical assistance in the form of winches or cranes, an actual unit would use tool-less slide-in removable modules containing no more than 48 cells. That equates to 24.96kg on Earth or 9.4848kg (a little less than 21lbs) on Mars. There will also be an associated thermal management system mass, in the form of heat pipes and aluminum plates, added to the mass of the super caps. Either way, current output is well below the maximum current limitation for individual cells. Your comments about individual cell charge level apply equally to battery or super capacitor modules and both types of power packs include circuitry that adequately resolve such issues. Our best electric motors are only about 95% efficient, so these figures are obviously not representative of the actual output requirement to deliver 15kW to the tracks of a tracked vehicle to maintain 20kph in an off-road environment. To figure out what the actual power requirement is, there are a series of relatively accurate but complicated calculations to determine our losses and thus the actual power output requirements to maintain a given speed in a given terrain. Edit: 95% efficiency means 5% is dissipated as heat and not converted into mechanical work. At a 15kW draw, this correlates to 750W, therefore the actual output requirement to convert 15kWe into mechanical work is about 15.8kW. The FastCAP super capacitors manufactured by the company from the link above currently has NASA contracts for use aboard satellites. The graphene-based super capacitors still in the labs are the least temperature sensitive of all the current generation super capacitor technologies. In about 5 years, this will become COTS technology because there are so many applications for the technology here on Earth. The point is, there are different types of caps available for different storage capacities, discharge rates, and operating temperature ranges. To this day, we basically have a handful of different Lithium-ion cell chemistries to choose from since all other cell chemistries are distant seconds in a variety of ways unless mass, volume, or charge/discharge rates are irrelevant. A Mars Direct habitat will not be as large as some other habitats? In 1991 Zubrin added a garage or Rover hanger? Sounds good. We can launch a rover hanger with a long range rover and a Marscat and then launch a tuna can and have them dock in orbit and head to Mars as one spacecraft. You think that we don't need to wait 500 years before we can make heavy and simple components on Mars? That's because to you it's important, it's status, it's being in the modern age instead of the stone age. To people on Mars, it's a lot of work for things that don't provide oxygen, food, or water, so it's a waste of time and energy. Someone is going to pay for a colony on Mars, either the government or SpaceX or a combination of both. I think that NASA will likely contract out to SpaceX to deliver some things to Mars using it's Heavy Falcon. Were you under the impression that a colony on Mars could trade with the Earth and pay for itself? There's just no way. Name one thing that you can produce on Mars for about one hundred times cheaper than you can make it on the Earth. This is in fact a problem, one that has been brought up numerous times on this board and never satisfactorily answered. Even under optimistic scenarios, it is difficult to foresee Earth-Mars transport costs dropping below several hundred dollars per kg. Sending things back to Earth won't be cheap either. What could a colony possibly sell that could pay for its very expensive imports? Trinkets and souvenirs aren't going to do the trick. It needs to be something that the entire world needs and will pay a bucket load of cash for. My own pet favourite is solar power satellites. Could we adapt O'Neill's vision to Mars? The Martian atmosphere is thin enough that a mass driver should be able to punch through it. Maybe we manufacture the satellites in Mars orbit and use reaction engines to ship them back to Earth orbit. This sort of project would require enormous infrastructure investment, but as far as I can see, it is the only product that has any chance of being sold a sufficient profit and in sufficient volume to pay for Mars colonisation. There are no windings in a homopolar generator? Okay, how much horsepower does it produce, how efficient is it, and how heavy is it? The Long Range Rover needs 4 DC motors of about 10 hp each. The WAVAR unit needs a small DC motor of about 2 hp for it's rack and pinion set up. The Marscat will need two 30 hp DC motors. I'd have to design a model and run some analytics to answer your questions. I see no issue with using ordinary electric motors for motive power. My partner is the one who wants to turn it into a motor. My interest in the design is purely as a generator. I can give you reasonable estimates for a generator of a given output, but would then have to model it to determine actual output, efficiency, and component masses. A firm called Guina Research and Development Australia claims to have a homopolar motor design with liquid metal brushes with a power-to-weight ratio of 30kW/kg, but I think it requires YBCO superconductors to achieve that PWR. The latest and greatest jet engines are about 10kW/kg, for comparison purposes. The best PWR in brushless DC PMM's for aircraft that I'm aware of, that are actual flight test hardware, are about 5kW/kg. That was for a DARPA project. I would stick with brushless DC PMM's for vehicles, but that's just me. Efficiencies of up to 95% are common in the better designs. I think I recall a couple that were up to 97% efficient. 25kW motors for your Marscat could weigh as little as 25kg for both motors, not including the liquid coolant and radiators required to keep the motors from overheating. Water isn't deep on Mars? If it's near the surface near the equator it warms up and evaporates every day unless it has salt in it. So, the only pure water you are going to find is going to be deep. Is there salt water near the surface? Probably, but that's not a good thing. If there's too much salt water then that's a dangerous place to drive anything into. Our rovers have had problems in sand because their motors are ridiculously underpowered. A toddler can crawl faster than the rovers can drive. The rest of you have caught on to the fact that rocket engines are basically reusable? Your plan increases the risk for the colonists because it's way more complicated, depends on crew transfers in space, depends on too many machines, and uses too much water and electricity, just to get back some rocket engines. When you're tens of millions of miles from home, being able to repair your own equipment is not "way more complicated" and it's actually "way less risky". When someone forgets to take something with them and that "something" happens to be the one thing needed to repair or refurbish something critical, then the people on Mars just might survive that mistake if they have the tools to repair their own equipment. One 3D print head to make electronics weighs less than a pound and a metal print head would weigh several pounds. The graphene-based conductive inks are literally some of the lightest materials in the world. Why do you think hundreds of pounds of powders are required to do anything useful with a printer? We're repairing or replacing electronics and small metal parts that go bad, threaded aluminum blocks that have their threads stripped, and reinforcing cracked or punctured pressure vessels. Hundreds of pounds of powder are not required to do any of that. Aerospace manufacturers don't use 3D printers to make brackets, so this repeated nonsense about only being able to manufacture shelf brackets is provably false. Try a new argument that has some kind of validity. What the hell is a "dust imager"? MOXIE doesn't "image" any "dust". It filters out dust. Do you mean a "dust filter"? You said your Marscat would have two 30hp electric motors powered by Lead-acid batteries. Let's do some more basic math to show why your insistence on Lead-acid batteries weighs more than my 3D printing solution. 60hp is 44.75kW. An Interstate 12V battery stores 75AH and weighs 51.8lbs. That's 900Wh of electrical power storage. To run the Marscat for 1 hour, let's optimistically assume we only need 22kWh worth of electricity. That means 24 lead acid batteries are required to run the Marscat for slightly less than 1 hour. For comparison purposes, a SmartBattery 12V 260AH Lithium-ion battery weighs 80lbs. That's 3,120Wh of electrical power storage. Those figures are for commercial products that anybody with money can purchase. Apples to apples, a SmartBattery 12V 75AH Lithium-ion battery weighs 25lbs and an Interstate 12V 75AH Lead-acid battery weighs 51.8lbs. Here on Earth because there is oxygen in Earth's atmosphere and Lithium reacts with Oxygen when a cell ruptures. There is no significant amount of oxygen in the atmosphere on Mars. Mars seal level is equivalent to Earth's atmosphere at about 130,000ft. We use CO2 to extinguish electrical fires. The Lithium-ion batteries are also capable of many more cycles than the Lead-acid batteries and have better cold temperature performance, just in case you needed to run the Marscat for more than a few months before the batteries quit working. With the 683lbs I saved by using batteries that would actually last 2 years in an environment like the surface of Mars, I can afford to deliver the print heads, the inks or powders, and the robot. I would need 24 lead acid batteries to run the Marscat for one hour? No, I wouldn't. Deep cycle batteries have 900 cold cranking amps at 12 volts (Watts = Amps x Volts), so that is 10,800 watt hours, not 900 watt hours. I think eight to ten batteries would provide one or two hours a day of use and then they would be recharged. We don't want to run them down too much. Lithium-ion batteries store more energy than lead-acid, there's no doubt about it, but they short out too often and catch fire. We can't have that on a spacecraft. Now, the lithium-ion batteries for the Marscat could possibly be assembled on Mars so there's no risk to the spacecraft in flight. The lead-acid batteries for the Marscat and Long Range Rover could have the batteries empty of water and then add the water on Mars. That might provide more safety from any kind of short happening in any of those batteries from launch vibration or aero-capture. Battery capacity is measured in amp-hours, or "AH". If the capacity of a 12 volt battery is 75 amp-hours (75AH), then that means it can deliver a maximum of 75 amps of current for one hour at a voltage of 12 volts. You get less than that in real life, but I'm trying to keep this simple. Cranking amps are a marketing tool used to tell people how fast their battery can discharge without using confusing them with terms like energy density (how many watts of power the battery can store for a given volume and mass) and power density (how many watts of power the battery can deliver in a given unit of time). The "900 cold cranking amps" in your example means the battery can deliver a maximum of 10.8kW of electrical power to an electric starter motor (1hp = 745.7W, so 14.48hp, assuming 100% conversion efficiency), but if you try to discharge a 75AH Lead-acid battery that fast it'll be completely discharged in 5 minutes. 5 minutes is the maximum length of time any 12 volt 75AH battery (irrespective of what type it is, Lead-acid, Lithium-ion, Nickel Metal Hydride, Graphene, etc) would deliver current at a rate of 10.8kW per hour. Like I said previously, it's less than that in real life if you don't want to destroy the battery. Going past 80 DoD (Depth-of-Discharge) is typically not conducive to long battery life. Peukert's Law also affects battery capacity as a function of discharge rate. The equation shown above does not account for temperature, number of cycles already completed (causes the Peukert exponent to increase), or self-discharge. This is just extra stuff for you to use to figure out exactly how long a battery can be discharged. You'll need to get the Peukert exponent from the manufacturer. If you get this information, then you can get a reasonably good idea of how the battery will actually perform. Temperature is also critical. Battery capacity diminishes in cold temperatures and increases in warmer temperatures up to a certain point. Now that you know how to correctly calculate battery capacity, do you still want to use Lead-acid? ISS uses lots of Lithium-ion batteries and there have been no fires aboard ISS from Lithium-ion batteries. Properly designed Lead-acid batteries won't short, either. Do I still want to use lead-acid batteries? Yes. Do you still want to risk the entire spacecraft and crew lives by shipping multiple lithium-ion batteries? ISS uses lots of lithium-ion batteries and there have been no fires? There are video's on the internet of people's phones catching fire. It's rare but it happens in lithium-ion batteries much more than lead-acid batteries. Properly designed lead-acid batteries won't short either? Vibration from launch, aero-capture, parachute deployment, and landing could cause a battery to short. You would have to have batteries powering the Mars Hab but the batteries in the rover or Marscat wouldn't have to be powered. You could install the acid plates on Mars and add water. O.K., O.K., enough of this contentious "bravo sierra." What we're ALL interested in is having successful outcome to man's first landings on Mars. Whether we use Lithium Ion Batteries or Lead Acid batteries to power the hypothetical rover makes for "interesting discussion,"
At the moment, we're all busting our gums arguing about future details when we should be campaigning vigorously for the first mission---ANY mission--that indicates follow up manned spaceflight. We need to move forward from the 1989 concepts in view of advanced orbital assembly abilities and ISS availability. This is, as Dook stated, about making the missions SUCCESSFUL.